Welcome to Sloppy Joe's! Since 1933 Sloppy Joe's hospitable staff has welcomed patrons daily. Visiting the Internationally known bar, guests are instantly enveloped by the history of Sloppy Joe's, Key West and Ernest Hemingway. Sloppy Joe's has been located at the Corner of Greene and Duval streets since 1937. Beginning at 9:00 a.m. customers enjoy their favorite beverage with something from the menu, or shop at Sloppy Joe's world-famous Retail Shop which offers a great selection of clothing and souvenirs. As morning transforms into day, so does Sloppy Joe's. Live entertainment begins at Noon and lunch continues with a menu offering quality food and satisfying large drinks. While Key West doesn't close down for Siesta hour anymore, things still slow down in the breezy afternoon hours. Time to kickback and unwind with a cold cocktail as the live music continues. Enjoy the party in Sloppy Joe's main bar or visit our other room: the Backroom "a saloon behind the stage" it offers the same great drinks, food, with Satellite to watch all the games on Big Screen TV. "Still the best party in town!" Sloppy Joe's turn's it up a notch at night. The band rocks until 2:00am, and tables are cleared for dancing into the night. 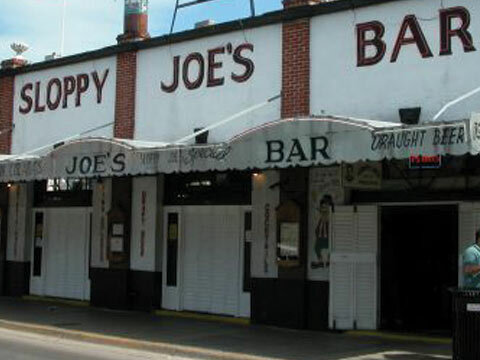 From 9:00am to 4:00am Sloppy Joe's has something for everyone "Sloppy Joe's A Key West Tradition!"